24 “Everyone who listens to these words of mine and acts on them will be like a wise man who built his house on rock. 25 The rain fell, the floods came, and the winds blew and buffeted the house. But it did not collapse; it had been set solidly on rock. 26 And everyone who listens to these words of mine but does not act on them will be like a fool who built his house on sand. 27 The rain fell, the floods came, and the winds blew and buffeted the house. And it collapsed and was completely ruined.” (Matthew 7:21–27). There’s a dangerous mindset among some Catholics. It’s one where a person believes he can reject a Church teaching and still be a good Catholic. In fact, often the person thinks he is a better Catholic than those in authority. He believes the Church teaches wrongly on a subject and has lost her teaching authority as a result. This person believes the Church can only regain her authority if she will either abandons a teaching he dislikes or reverts to a time he thinks was a golden age for the Church. Often such a person will think he is being faithful to the Church because he is faithful to that idealized view of the Church that he wants to defend. But that’s not being faithful to the Church. The Church consistently keeps the teaching Our Lord passed on to the Apostles, from generation from the first century down to today. Whether the head of the Church is St. Peter or Pope Francis, it is the same Church and the same faith, with the same God protecting them in feeding the sheep (John 21:15-17). From the 1st century to the present, Our Lord has built His Church upon the rock of Peter (Matthew 16:18). He has insisted that people heed this Church (see Matthew 18:17 and Luke 10:16) to the point of saying that rejecting the Church rejects Him. Neither the radical traditionalist nor the “Spirit of Vatican II” Catholics give their assent to this authority. Both think there was a break in teaching. The radical traditionalist believes the Church went wrong because of Vatican II. The “Spirit of Vatican II” Catholic thinks the Church went wrong before Vatican II, finally got it right, before Blessed Paul VI and his successors “betrayed the Council." Neither group is right. During the two millennia the Church has existed, we’ve had good Popes, mediocre Popes, and bad Popes. No matter who was Pope, you will be able to find some behavior which was wrong, weak-willed, or at least ill-considered. But even with the worst Popes in our history, they have never taught error [†]. The Church has never taught good was evil nor that evil was good. Have individual priests and bishops fallen into error? Yes, at times. But that is not the same thing. If the Church is what she claims to be then, to be faithful Catholic Christians, we must give our assent to the teaching of those given the role of shepherd. We cannot pretend we are being good Catholics if we say we must reject Pope Francis in order to be “faithful” to the Church. Nor can we say we’re rejecting Church teaching in order to be faithful to Our Lord. He said that if we love Him, we must keep His commandments (John 14:15) and rejecting those He sent is rejecting Him (Luke 10:16). If building a house on rock is listening to and obeying Our Lord’s words, and His words include telling us to hear His Church, then it follows that listening to the Church because Our Lord gave her authority is obeying what He said. It also means that obeying only when it suits us—which is failing to keep His words when it doesn’t—is building a house on sand. Many people resent the implication they are building on sand. They think it would be easy to tell the difference, just like it would be easy to tell the difference between a pile of sand and a boulder. But the difference was not always clear in Galilee and Judea when Jesus told this parable. The sand could feel solid and people could think they were building on a solid foundation. The sand could be solid for years. But if a torrential rainstorm came, that assumed solid base would wash away. (This is sand, not rock, even though it might look like rock. Likewise, if we put our trust in our personal interpretation of God’s word and what part of Church teaching we think is right, it may seem solid. Our faith may stand for years. But in a time of trial, we may find our faith collapsing because we put our faith in our own perceived wisdom and righteousness. I reflect on this when I consider the rebellion against the Church during the pontificate of Pope Francis. Not only did radical traditionalists and “Spirit of Vatican II” Catholics assume a break in teaching, but some Catholics who were staunch defenders of St. John Paul II and Benedict XVI bought into these claims as well. What I think happened is this. The media between 1968 (the year Humanae Vitae was promulgated) and 2013 focused almost entirely on the Church teaching on sexual morality and abortion. So it was easy to think this was the sole focus on the Church. The Popes in this period spoke on many other topics well. But the media did not cover them. So it was easy to think that so long as one stood up for life and sexual morality, it was enough. So when the media began covering Pope Francis when he spoke about other areas of Church teaching, many people believed this new emphasis from the media was a change of teaching by the Pope. Just as the media ignored St. John Paul II and Benedict XVI when they spoke on other teachings, the media ignored Pope Francis when he spoke on life and sexual morality teachings. So, when Pope Francis spoke on these topics, Catholics who assumed that their faith was mostly about defending life and marriage either felt betrayed or elated, depending on where they stood on the defense of life and sexual morality. There was no break in teaching and Pope Francis’ predecessors did not neglect these other issues [#]. Offering my opinion, I think what people built their houses (that is, their faith) on was not the rock of Jesus’ words and His Church, but on the sand of what they thought Catholicism was, based on a partial understanding. I see the rains as the increased—but grossly uninformed—media coverage about what the Pope said. 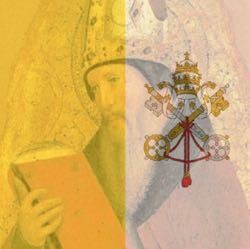 The house of faith collapsed when people assumed that while the Church could err, they themselves did not and see any discrepancy between their presumptions and what the Popes said “proved” the Popes erred. I call this a collapse because they’ve damaged their faith in God’s Church and, as a result, they’ve damaged their relationship with God as well. I believe we avoid this ruin by putting our faith in Our Lord and in the Church He built, trusting Him to protect it from falling into error. Yes, there will be times when members of the Church—even high ranking ones—do something that scandalizes us. But the bad behavior or personal error of individuals is not the teaching of the Church. There is no break. In the same way, we must stop placing confidence in our own views over the teaching of the Church when they differ. Every schismatic and heretic in history believed they were right and the Church was wrong. They wanted to “protect” the Church from error, but never considered their rejecting the Church was a sign of their own error. It is only when we realize that it is far more reasonable that we are in error than to think God has stopped protecting His Church that we can pull up the stakes from the sand of our pride and error and move to the rock of faith in Christ. [†] We need to be clear here: Teachings are not the same thing as bad policy or bad laws in the Papal States before 1870. Nor should we confuse teachings with the opinions from individual members of the Church. These have never been authoritative in any way. A Church of a Billion Popes? Do They Speak the Truth? Which is Manmade? The Church or Your Movement?